How do you make a free, public, 21st century school that is caring, creative, fun, innovative, and sustainable? How do you ensure that school retains a rigorous curriculum that pushes every student to be and do his or her best? You create an Inspire Academy! The curriculum at our Inspire Academies adheres to state standards in all subjects, including the core areas of language arts, mathematics, science, and social studies. But in order to fully address student needs, we have designed a "three tiered curriculum" that not only meets state standards but also helps students follow their passions and become self-directed learners. Students explore information daily in great depth via projects, field experiences, problem solving, collaborative groups, oral and written communication, entrepreneurialism, and much more, using a skill mastery approach. This approach creates a dynamic learning experience that allows independent thinking and problem solving to develop and flourish. 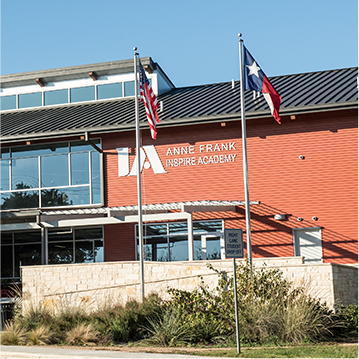 Welcome to Anne Frank Inspire Academy (AFIA), where our goal is to create a caring, creative, fun, innovative, and rigorous learning environment. At AFIA we hope to instill our core values of innovation, embracing greatness, integrity, and joy among all of our students, staff, parents, and community. It is my honor and pleasure to be a part of the AFIA family. I am energized and deeply committed to making a positive difference in the lives of your students. As an instructional leader, I have a very uncompromising view that all students are able to learn and be successful. At AFIA, we are able to build strong relationships, collaborate, implement a viable curriculum, and create a support system that helps create an environment that fosters learning and helps every student maximize his/her potential. Our remarkable staff, involved parents, and committed students help make AFIA a wonderful place to Belong, Be Great, and Find Joy! I encourage you to embark on this journey of learning and growth with us! Our schools are designed to create a small, family-like environment that allows each student and teacher to know one another and ensure that no one “falls through the cracks.” By partnering with award-winning, international architects at Fielding Nair, we’ve designed an incredible campus that includes eight outdoor learning areas (including a tree house and amphitheater); a variety of creative, indoor learning studios (like MakerSpaces and Yoga studios); and zero hallways! All of our facilities are also equipped with seamless technology via SkyDrives. Mission: To increase the capacity for human greatness. Vision: Creating 21st century learning models for use around the world through leadership, innovation, safety, technology, integration, synergy, and transformative power. Value gives meaning to what we do. But at Anne Frank, our core values of innovation, embracing greatness, integrity, and joy are the driving force behind every decision we make. At Anne Frank, we are active members of our community—We Belong. We are becoming experts in every life arena—We can Be Great. And we know there is purpose in life—Therefore, we choose to Find Joy. In short, we believe students can be self-directed learners, and schools can be both fun and challenging.